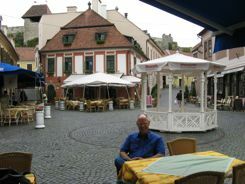 Eger wasn't on our list of places to visit when we planned to tour the Hungarian countryside. It's a small town that can be reached by a two hour train ride from Budapest, but we actually drove there on our Hungarian wine adventure. Budapest to Tokay and back to Eger makes for a great road trip. We first found the delightful wine tasting area just outside of town known as the Valley of the Beautiful Women or the Sirens Valley. Since we didn't have a map, we had to stop and ask some locals for help... and they were so helpful that they told us to follow them, and they led us right to it! It wasn't until the next day that we made our way into the town itself. The Sirens Valley is a horseshoe shaped area that has many cellars and caves carved into the side of the mountain where small wineries have tasting rooms. There are hotels right in the area so you don't have to worry about driving…. There is zero tolerance for drinking and driving in Hungary. We shared wine and food with a couple of friendly Hungarians who were also wine tasting. 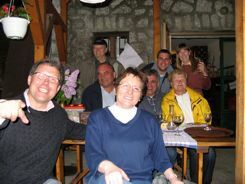 Then we were joined by a family from the Czech Republic… and finally by the proprietor of the cellar and his wife. The conversation went on in English, Hungarian, and Russian. As wine lovers we all had a great time, and Mark and I learned a lot about Hungarian and Czech history. I finally had to tell our new friends that I had had enough because I was starting to understand the Russian! The region is known for its robust red wines.... yes, Bull's Blood, but the town itself is charming. 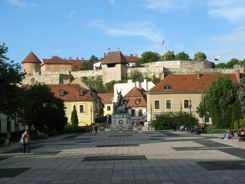 Other than its wine, Eger's claim to fame is that, against all odds, they held off a Turkish siege and kept the Ottoman Empire from expanding across Western Europe. It was from the castle on the hill that the outnumbered Hungarians held out... and the wine they drank became the legendary Bikaver or Bull's Blood. You can tour the castle. There are museums inside, but the fun is to wander the grounds and enjoy the view out over town. It's one of Hungary's oldest and most colorful little cities. The old center of town is what is of interest to tourists. There are several pretty cobblestone streets to wander and Dobo Ter, Dobo Square, is a nice place to stop at an outdoor cafe and enjoy a bite to eat... and a glass of wine. You'll find churches to visit and many beautiful Baroque buildings to photograph. Explore the fun covered market. There is also an old university, the Lyceum, where you can visit the library and observatory. In 1552, the Turks were expanding their empire through Europe... thousands and thousands of them were headed west through Hungary. They besieged Eger on their way to Western Europe. The townspeople holed up in their castle. Two thousand soldiers led by their Captain were in the castle with the townspeople for a month. With food and water running short, Captain Dobo Istvan and his 2,000 Hungarian warriors dumped all the wine together. Who knows how many local varietals were mixed together creating a ruby-colored wine. The warriors drank it to give them strength to fight off the Turks. The wine spilled over their beards and onto their clothes and armor... coloring them blood red. Word spread among the Turks that the Hungarians were drinking the blood of bulls to make them strong. The Turks said they had been forced to retreat because they couldn't defeat the Hungarians.... why? They said the Hungarian's red-stained beards were proof that the bull's blood gave them super-human strength and endurance. And that is when the legend of Bulls Blood Wine was born. Bull's Blood Wine, or Bikaver as the wine is known in Hungary is the pride of the region. You'd tell them you were drinking Bull's Blood! 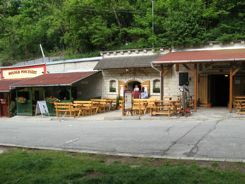 You can drive or take a little tourist train out to the Valley of the Beautiful Women to sample Bikaver at the wine tasting cellars that line the valley… or you can do as we did and spend a night in both places. Mostly we just enjoyed the town as a pretty and quiet place to stop for a night... and enjoy the wine, of course. Stay in town or out by the Valley of Beautiful women. You can get to town from Budapest by train or by driving as we did. Hotels were reasonable and easy to find. There were plenty of parking lots for the car. If you're traveling to Budapest, why not take a little diversion and explore Eger.... and taste a little Bull's Blood... just for bragging rights.